Ask me my opinion, and I'll give it to you. And that is just what Alison from TeaVivre did. She asked me to try their teas, sent me some free samples, and wanted me to let you know what I thought. The first barrier: I don't drink tea. I have never been a tea drinker. I actively dislike the smell of black and green teas. Weird, huh? I had mint tea once in Morocco, because it would have been culturally rude to say no. And, honestly, it was so sweet I thought I was simply drinking mint syrup. It was quite tasty. If there was black tea in there, you could have fooled me... and obviously they did. Mark convinced me that I would like fruit and floral tisanes. That started in the centuries-old Officina Profumo-Farmaceutica Santa Maria Novella in Florence. Tisana No. 17 (now called "Relax") has the most incredible fragrance. After that came rooibos red bush “tea” from Botswana. The fruity, floral flavors tickled my palate. I told all this to Alison, and asked if TeaVivre had any fruit or herbal teas. Her response was quick and affirmative. She said she would send me some fruit tea samples to try. I received them a couple of weeks ago and have been enjoying them very much. Individually packaged samples of Unbridled Love, Waterlilies, Blueberry, Paris Champs, and Sweet Peach. Each comes with a wonderful combination of fruits, flowers and herbs. For example, Unbridled Love contains apple, roselle, rose hips, orange peel, and black currants. 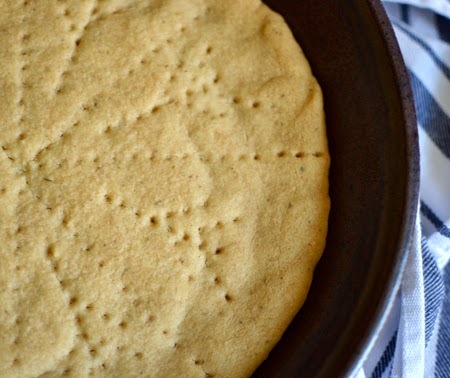 My first taste was Unbridled Love and, to accompany that, I made lavender shortbread. I simply used my grandmother's traditional shortbread recipe and added some ground lavender buds. The combination was perfect. 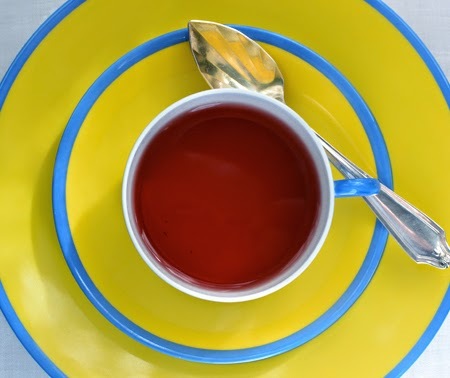 The flavors of their teas are clear and bright, the aromas gentle and alluring, and the colors, when brewed, are deep. They are good hot (with a side of shortbread), make fantastic iced tea, and work well as an ingredient in recipes. My next project is either a sorbet or gelato... perhaps blueberry? The packaging is really good. Depending on what quantity you order, it comes in either a resealable pouch, or an airtight tin - both great ways to keep your teas fresh and ready. 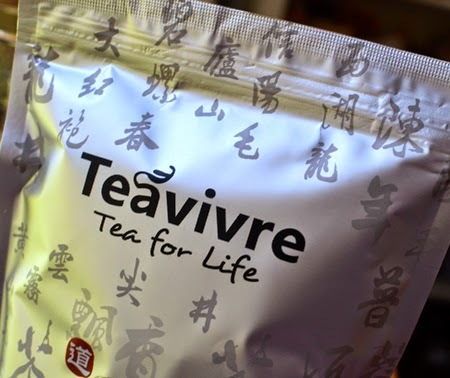 I give TeaVivre two thumbs up for great tasting fruit tisanes. You can find them online at TeaVivre. 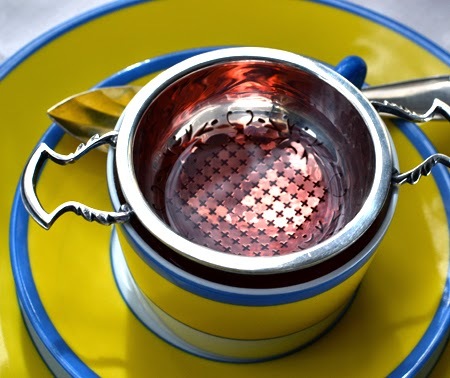 They have many more options than those that I tried, including a selection of organic teas, as well as some exquisite tea ware, both traditional and modern. My favorites are the double-walled glass tea cups! Now, on to the shortbread. This recipe card was in my maternal Gramma's handwriting, and one my mother never made for us. I got it when my mother died, in a file with all her other recipes. I have made it often, and it has become even easier now that I have a Kitchen-Aid mixer. It has but three ingredients (before the lavender was added), and comes together in minutes. What can be bad about something that is but a mixture of butter, sugar and flour? Put the lavender buds in a spice grinder and grind to a fine powder; there will still be bits and pieces of the husks. Empty the lavender into a very fine-mesh sieve and shake until all the fine powder has come through. You will have between 1 and 1 1/2 teaspoons lavender powder. 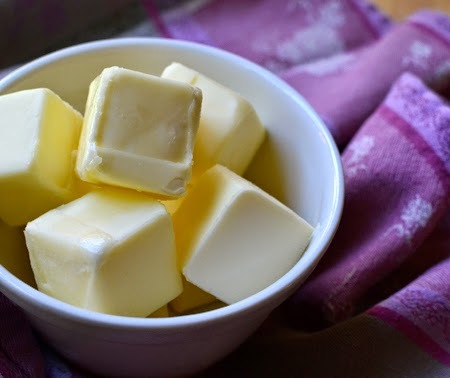 In the bowl of a standing mixer, cream butter and sugar. Add the flour and lavender powder and mix on low speed until it comes together as a dough. 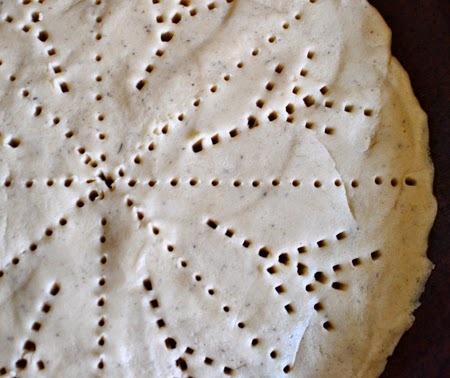 Turn the dough out into a 10-inch pie plate and pat the dough evenly to fill the plate. Using a fork - or a cake breaker, as I did - divide the shortbread dough into sections - you can do a checkerboard, or wedge shapes as you see here. I then used a fork to make a very simple thistle pattern. Bake the shortbread for 1hour 30 minutes, or until golden brown. Remove the shortbread from the oven; turn off the oven, and close the oven door. While it is still soft enough to cut, slice the shortbread into pieces along your dotted lines, Place the shortbread (still in its baking pan) back into the oven, and leave it there until the oven and shortbread are cool. 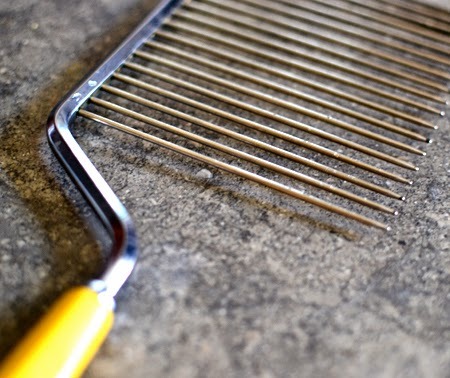 Remove from the pan and place in an airtight container. Will keep for several days. 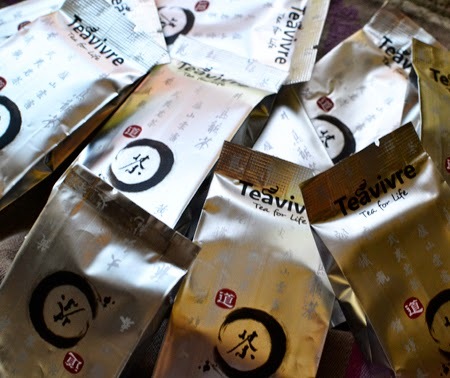 Disclaimer: While I was sent free samples from TeaVivre to test, my opinions are my own and I was not required to write a positive review. I do not test or promote products that I do not or would not want to use. Those herbal teas sound and look quite robust, which is what I miss in the usual variety. These sound very special. Thanks, Christina - I have to admit that it was one of the most fun posts to photograph! 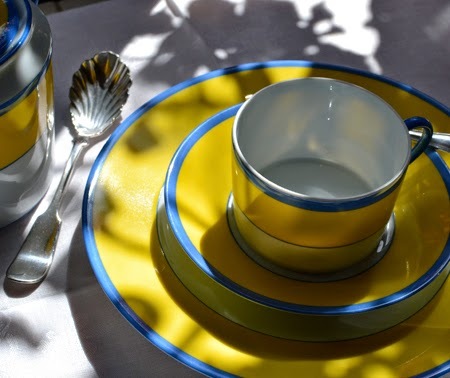 Finally an excuse to get out the Monet china and that beautiful tea strainer. 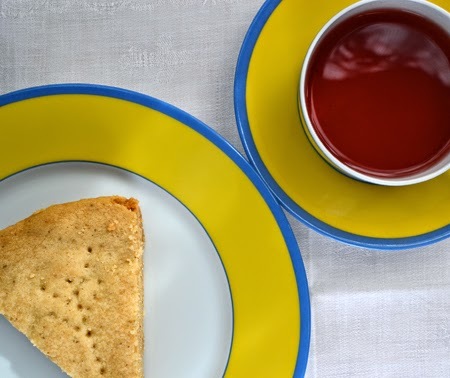 Tea and shortbread...my most favorite paring...might just turn on the oven. At least it is a low temperature, Jill! Or, you could leave your car in the sun and see if they would bake on the dashboard. :) Glad you liked the post! It works perfectly for cocoa, too, Ahu! :) I hope you like the shortbread! I used to love shortbread once upon a time... lovely with coffee.... your tea party is very sophisticated, just beautiful! 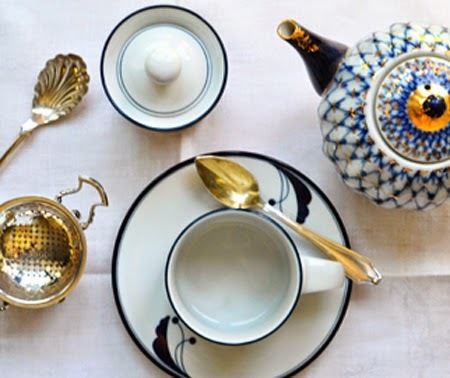 All the pretty tea accoutrements make me wish that I did drink tea! I still love shortbread, but only on special occasions. Otherwise, my butter intake would be out of control! I might just have to try some of these fruit teas because I too, have never been a tea drinker. (Always wished I was because I love the ceremony of it.) I LOVE that you're trying them in marinades. Can't wait to see what you come up with! I know what you mean Valentina - doesn't a cup of tea sound so good in theory? These fruit teas did the trick for me. I will try to get the marinade out soon! Hi David, love short bready kinds of things, this looks wonderful, your pictures are perfect. Thanks, Cheri! 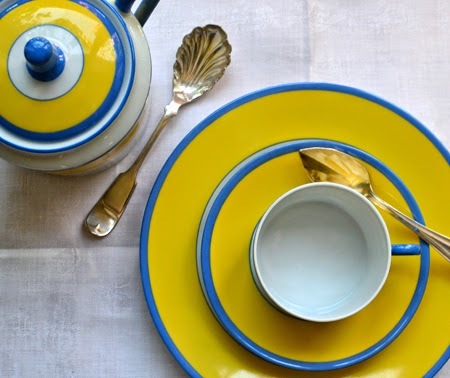 With all the beautiful tea ware we have, this was a fun post to shoot! I love how honest you've been in this write up David. A tea review from a previous non-tea-drinker! As an English expat I was raised on tea but I've only recently become a little more tolerant of fruit varieties (pretty much the exact opposite of yourself!). Give me a strong cup fo Earl Grey or English Breakfast any day... but peach tea? Hm. I'm glad that you enjoyed them though and I very much look forward to seeing the culinary applications you've invented... the marinade sounds delicious! Oh, and as for the shortbread? Yum. 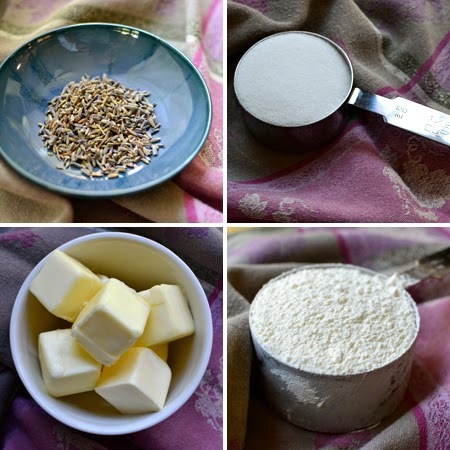 I love lavender in all sorts of baking... beautiful recipe! Lavender is such a great addition to baked things, but also in savory preparations, too. I love it under the skin of a roast chicken, for example... or in my lamb ragù. Drat! Now I am hungry! Shortbread....I should've named my baby "Shortbread!" David, another beautiful post. Such lovely tea settings. It's almost like I'm sitting there with you, sipping tea, nibbling shortbread. I think Daisy is a much prettier name, Colette! But Shortbread is, perhaps, a good name for a dog. Perhaps when you called the dog, people my bring you shortbread thinking that you were calling out in desperation!? Wish you were here, too - I need help eating all this stuff! For a man that isn't a tea drinker, you certainly did a beautiful presentation. I'm just the opposite of you, David. I don't care for flavored teas even though I drink tea every day. I'll take a good cup of Earl Gray to go along with your nice shortbread, please. Still feel that way about coffee, too. Give me cocoa any day, Greg. I can pretty safely say, that I won't sipping any black or green teas anytime in the near future. I only drink fruit teas so you are not alone :) Great idea to try them in a sorbet I will be very interested to see how that turns out. I have never baked with lavender before as I have always been paranoid about the potential soap flavour if I used too much. I will have to be brave and make some of your shortbread for Mr LG. Have a great day! • Pulverize the buds, as sometimes an entire bud can taste bitter. • Start with small amounts and work up. • Combine it with other herbs (it goes really well with rosemary and thyme). I'm all for the delicious shortbread - but tea isn't tea without tea. Okay - so you hit one of my snob triggers. I love tea - I was practically raised by Brits in Naples. Brits are very particular about their tea, as they taught me to be. However, I will confess that although I don't drink coffee, I do make it for John every morning. I love the way it smells, but hate the way it tastes. So, we all have our oddities! I'm SO glad you received the cookbook & that you love it. I hope the publisher will send you some others to review - it's really fun and John can't complain when I'm getting them free! I came from a family of tea drinkers - everyone but me. here is just something that I can't bear about the aroma. We generally don't call it tea in this house - it is a tisane. Nowadays, neither of us drinks tea or coffee - pretty much only good (Italian) cocoa every morning. It is nice of you to make coffee for John! I'm not a huge tea fan either , but the flavors in the samples sound very interesting. The lavender scented Scottish shortbread sounds and looks fantastic. Looking forward to the peach tea flavored chicken, this seems very intriguing. Thanks, Daniela - good to know that I am not alone out there in my non-tea drinking world! 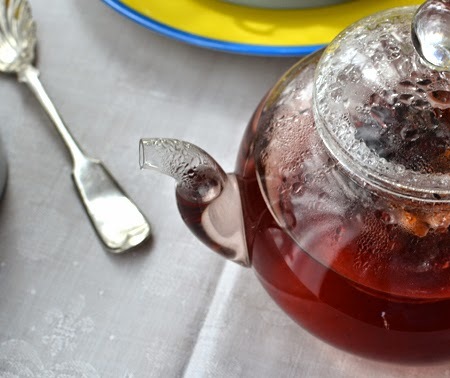 I have written the recipe for the peach (and ginger)-scented tea, and will put that up soon. David, oh I am such an avid tea drinker...I love visiting the local tea merchant in Bonn and inhale the smell while I am waiting in line to be served. I always buy a ton of loose leaf tea and I always ask for samples of new teas that I will immediately try at home. And I adore green tea as much as black or white tea. 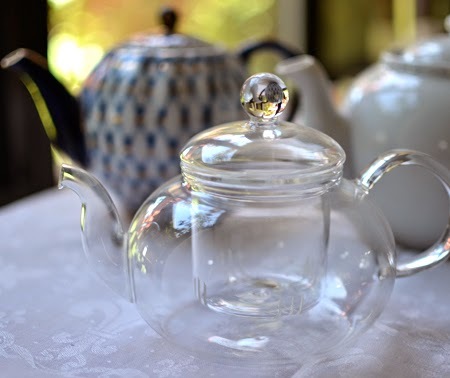 The collection ot your teapots is exquisite and the recipe sounds wonderful - I have baked with lavender before, it adds an awesome taste to buttery, baked goods. Your recipe sounds wonderful and I cannot stress enough how much I love that you use the family heirloom recipes in your baking! Andrea - I love how you enjoyed your trips to the tea merchant! What fun. 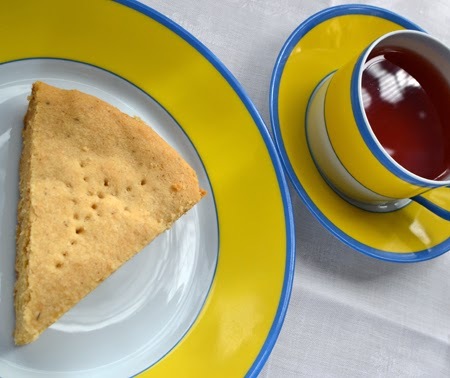 The shortbread is really a wonderful and very simple recipe - I hope you can try it sometime. I love this post, David! I am a huge tea drinker…I always order my tea on-line because I’m quite fussy about the taste. Lately my favorite tea is Earl Gray or Cardamon tea by Ahmed. 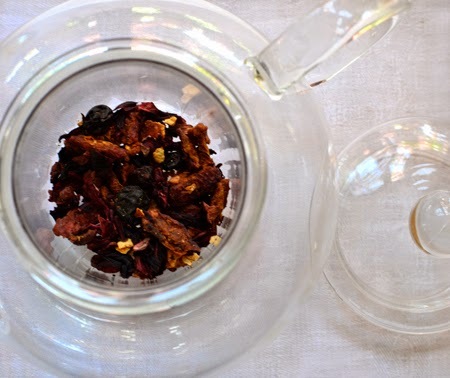 I’m always open to try different blends…my friends call me a tea snob! 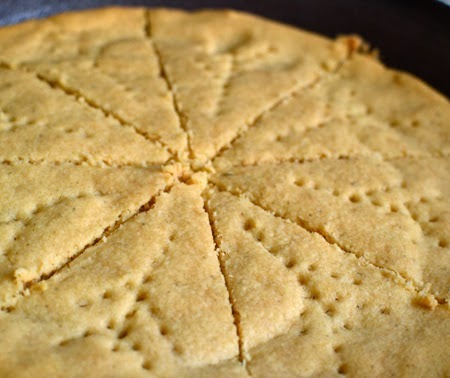 Your grandmother’s recipe for shortbread is similar to one given to me by a Scottish neighbor years ago. I used to make it for my kids as an after school treat…then one day my son came home and told me he didn’t understand why I couldn’t just buy Chips Ahoy, like the other mothers. Go figure! I bet your son regrets those Chips Ahoy cookies now, Kathy! Kids just don't get it, do they? I'm not a tea drinker at all (unlike my father who only drinks tea...) , but there's something soothing about the idea of holding a cup on a chilly day, or after a grueling work day. Nice post, and even nicer shortbread! That is definitely a reason to have tea! Paula - I am sure the food gods would allow for having your shortbread with coffee - they don't seem to mind that I usually have mine with cocoa!